Is everyone getting in gear for the holidays? I’m still planning our Thanksgiving meal. It will be just the 4 of us this year so the pressure’s off. I am starting to get a bit jittery about the holidays. So much to do! It’s all good, family fun though. 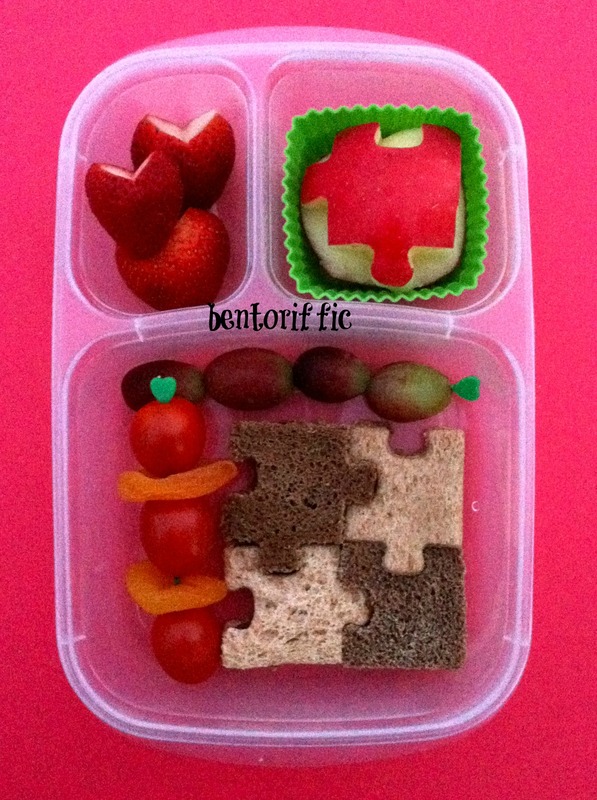 Miss A doesn’t have school this week so I’m just packing for Miss G, 4, and her preschool lunch. I made some almond butter mini pocket sandwiches with Rudi’s brand Honey Sweet Whole Wheat bread. It helps to flatten the bread a bit before making these pockets so the filling is less likely to pop through the bread. 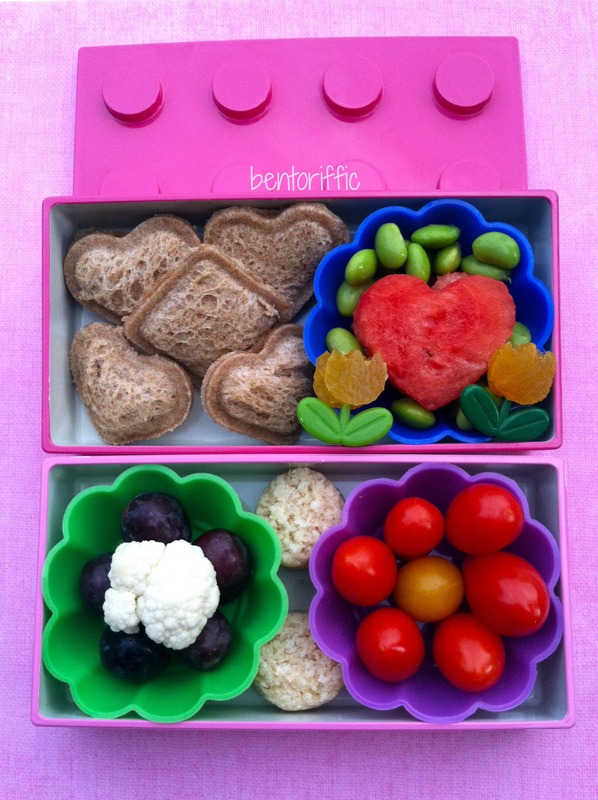 To the right of her mini sandwiches are watermelon hearts surrounded by steamed edamame and dried apricot tulips. In the bottom tier from the left are black seedless grapes, a piece of cauliflower, 2 Hail Merry macaroons in between the cups, and a silicone flower cup of grape tomatoes on the right. 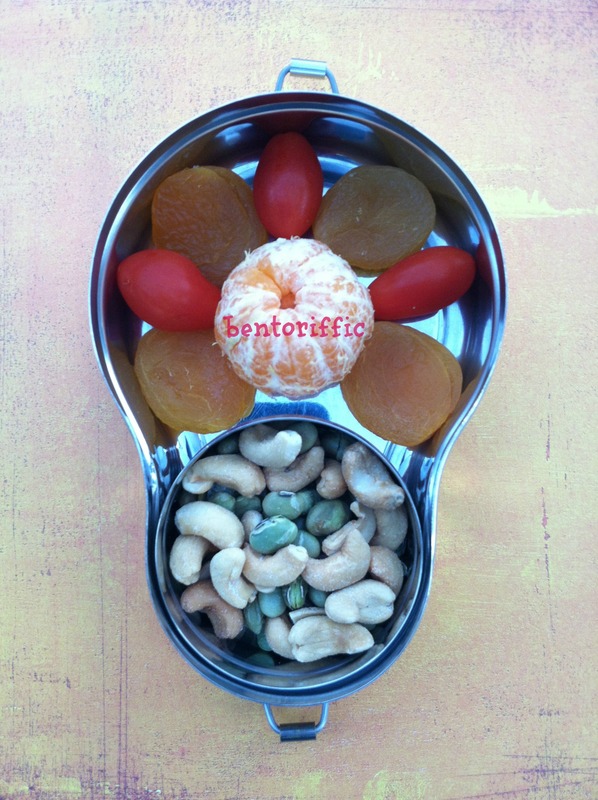 Miss G’s snack is 2 Crimson Gold organic apples, sliced plums, mango hearts and a dried apricot shape on a ring pop holder. I will be posting my Thankful Giveaway on Wednesday of this week. Stay tuned and come back to enter to win some fun goodies! It will be a good one! 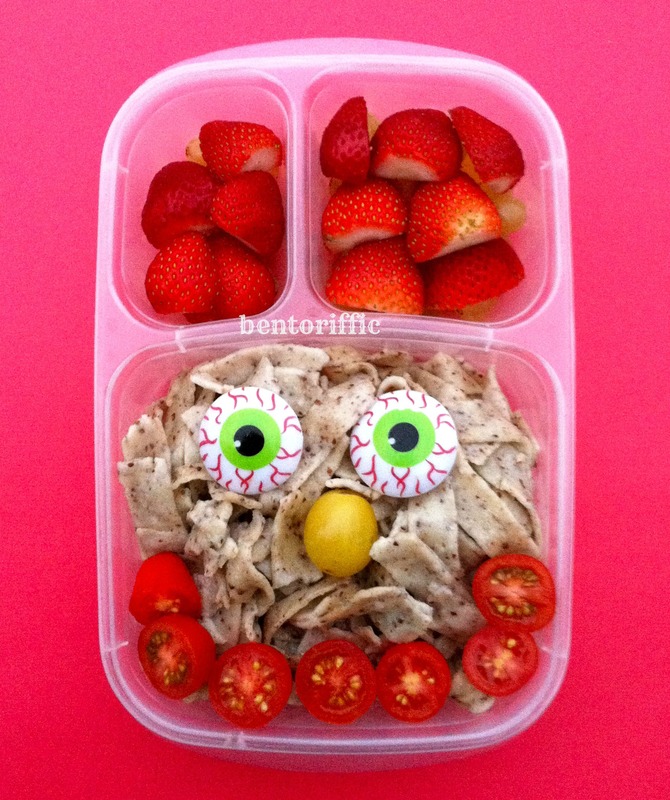 EYE love pasta! I really do, and so do my kids. What’s even better is that this stuff is homemade. Not by me, but my local pasta place here in Sarasota, Florida, Peperonata Pasta. They make all their pasta here in town, and it’s sold at Whole Foods stores all over the state. I usually pick some up from the owners themselves at the local Sarasota or San Marco Plaza farmer’s markets on the weekend. They make Vegan pasta that is incredible and loaded with healthy grains like quinoa, flax seed and millet. 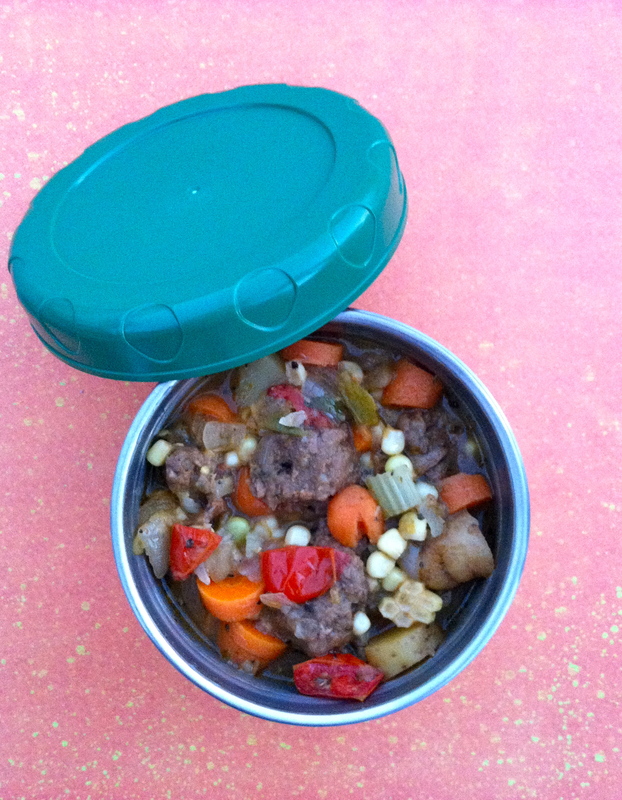 There are never leftovers in our house! Above is Peperonata’s tagliatelle vegan pasta topped with 2 eyeball rings and grape tomatoes. 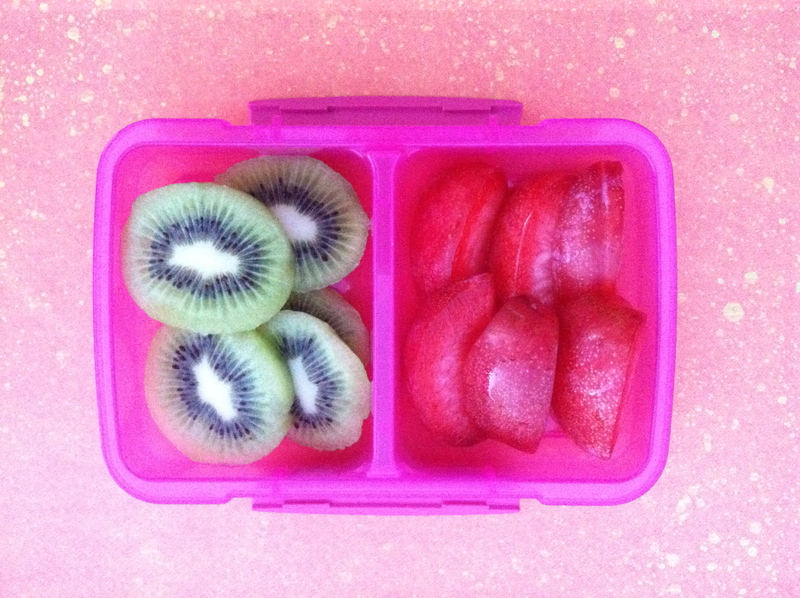 Underneath the sliced strawberries at the top are golden grapes packed in her Easy LunchBoxes. 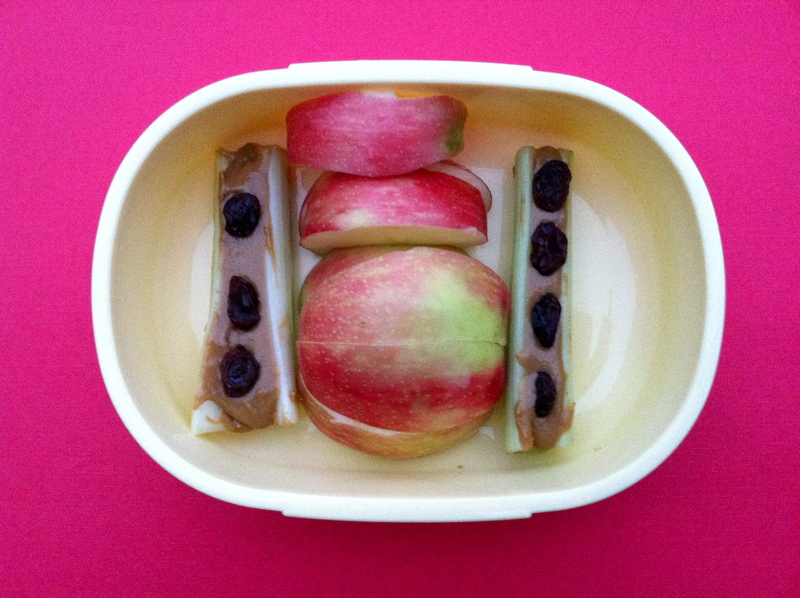 For her snack this afternoon, Miss G had sliced apples and ants on a log (celery with SunButter and raisins on top). So I spotted this glow-in-the-dark container at the store. It was filled with Skittles. 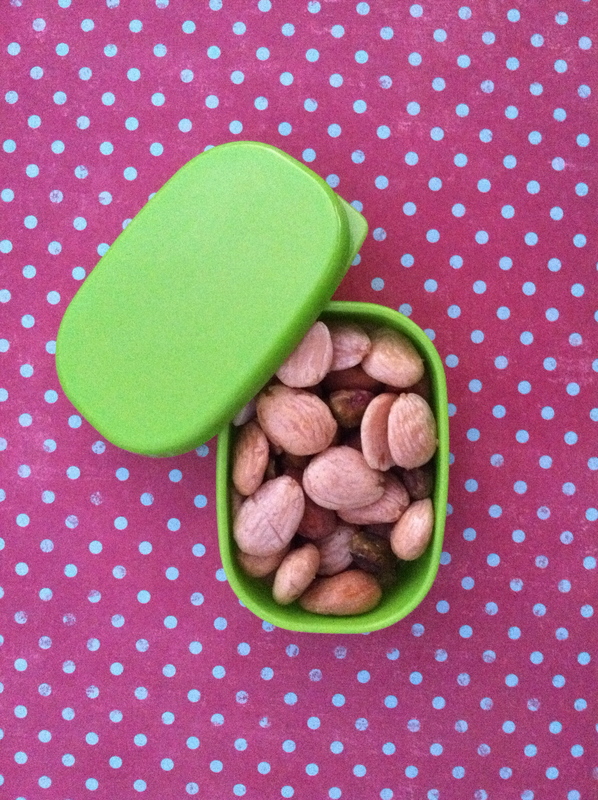 Of course, I dumped the Skittles and filled it with trail mix. The mouth twists open and shut. 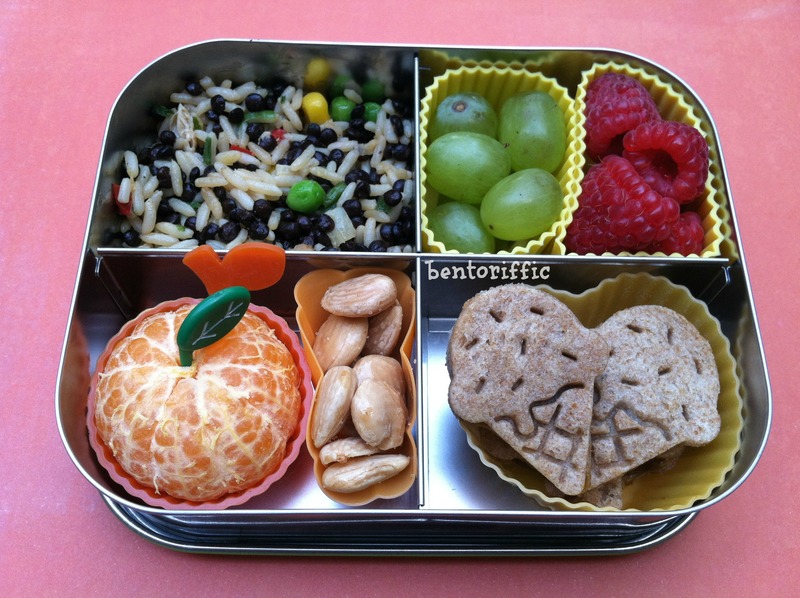 I love this for raisins, seeds, etc to make healthy snacks fun. 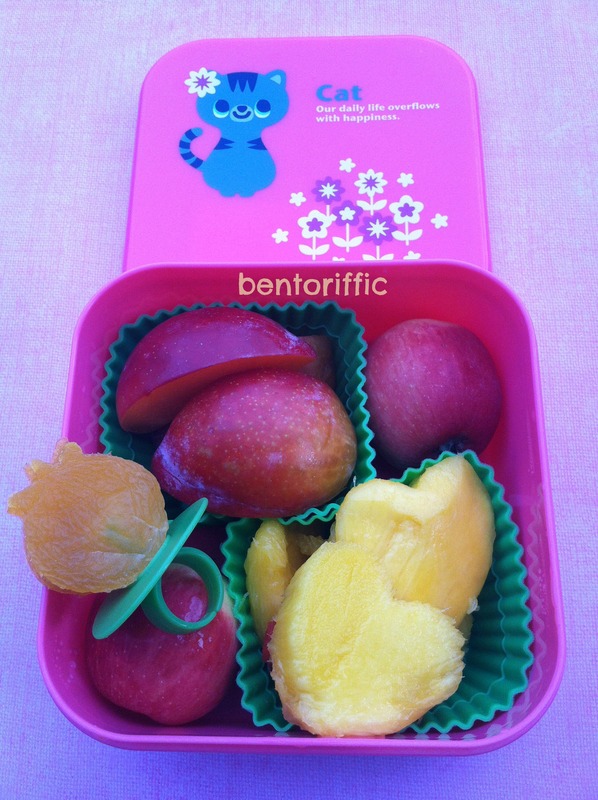 My husband had a container of soup (not shown) and this fruity bento to go along with it. At the top left are mango chunks, the top right is a clementine with Jack Skellington drawn on it. My kids are still to young for movie “The Nightmare Before Christmas”, but I love it. Who doesn’t love a good Tim Burton movie? 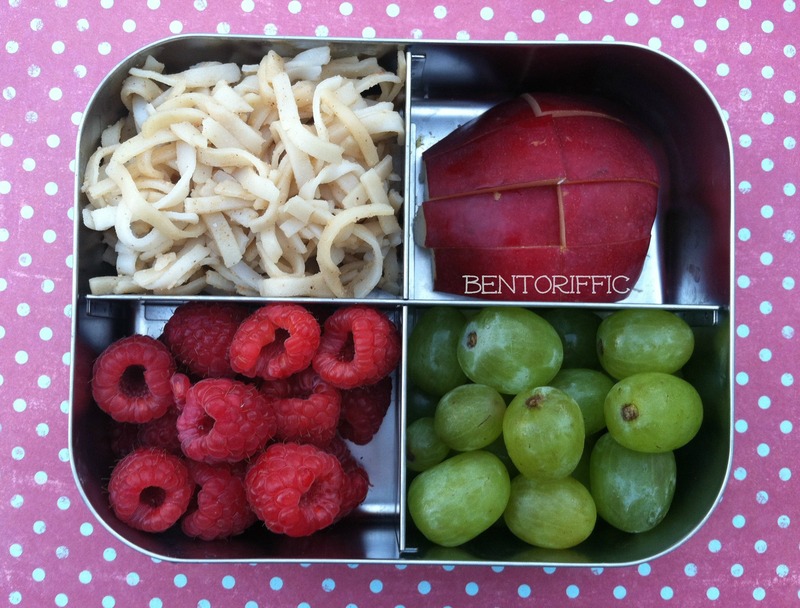 In the bottom compartment are green grapes, sliced dapple dandy pluots, and d’anjou pear sections packed in an Easy LunchBoxes container. 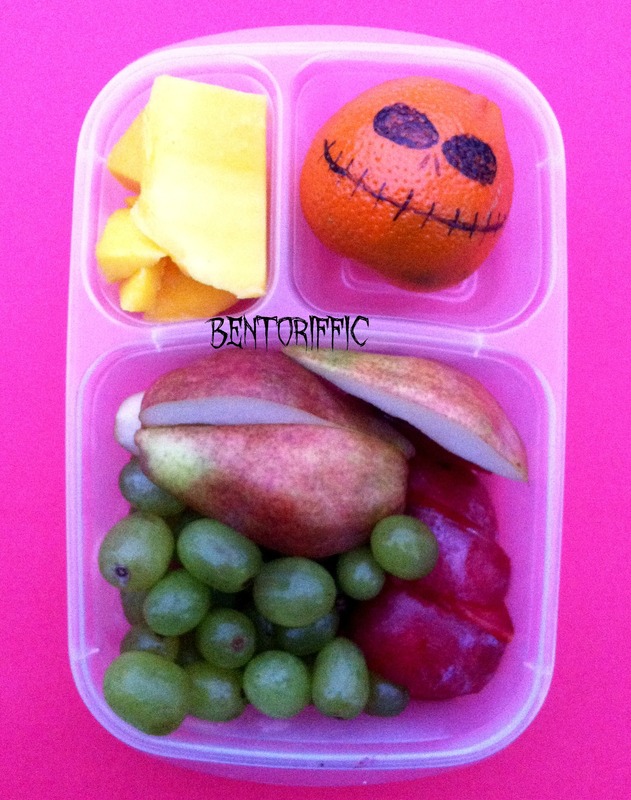 Some of my bento blogging friends also did Jack Skellington lunches. Click on each one to find more Halloween ideas! 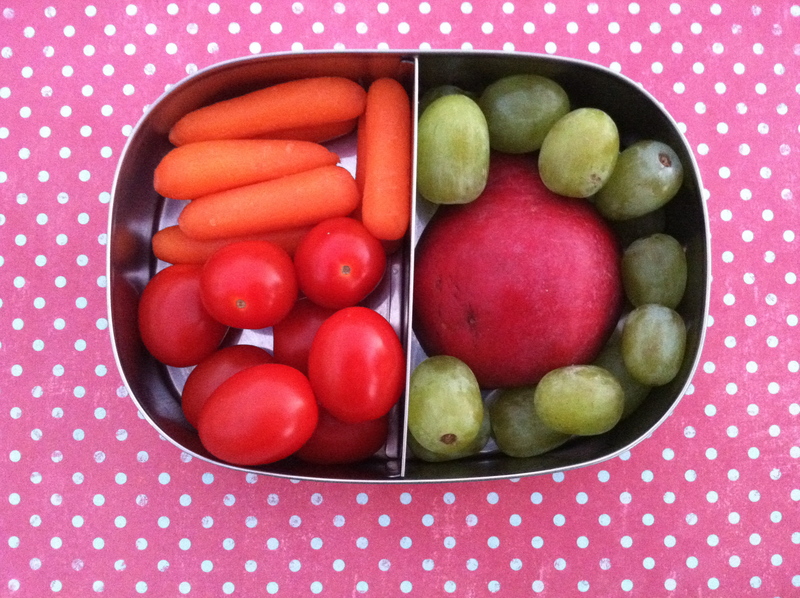 *What’s In Our Lunch Bags? 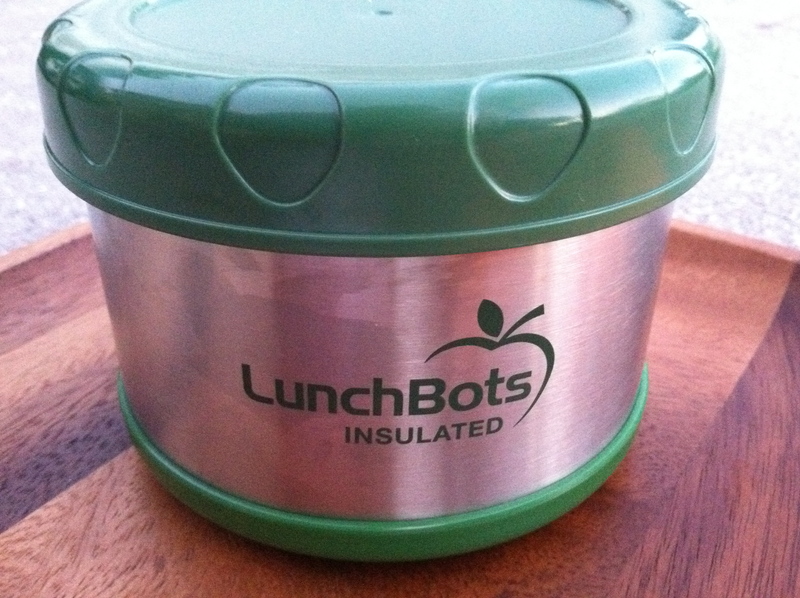 *What’s For Lunch At Our House? Welcome to Monday. 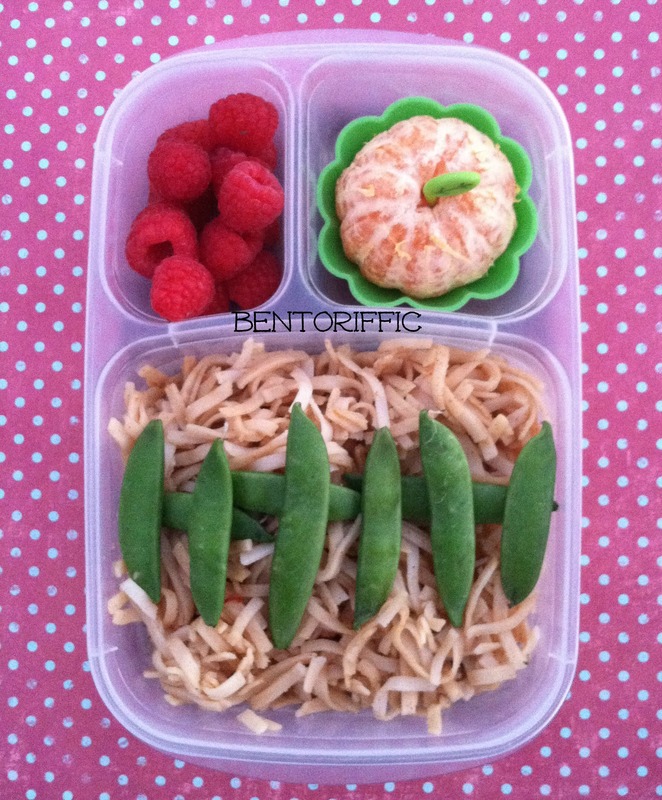 I’m off to a slow start today trying to tackle a big to-do list, and I’m late posting lunches! Hope everyone enjoyed their weekend. 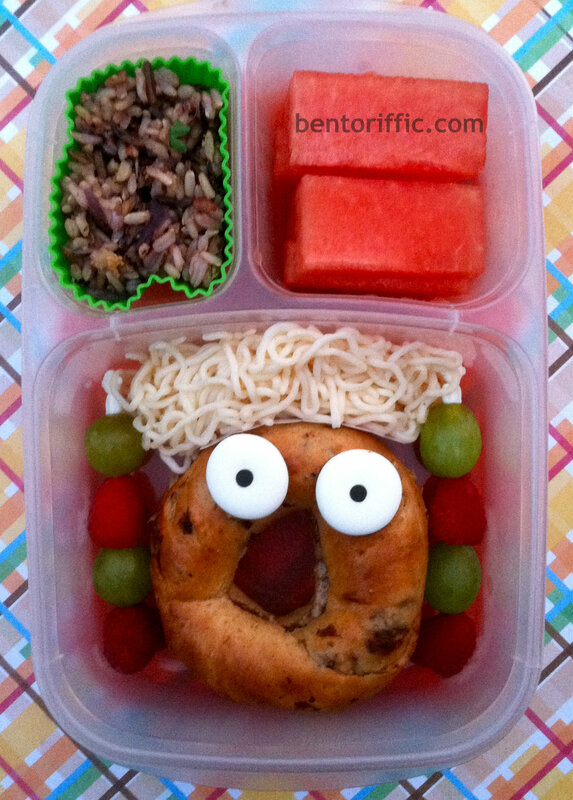 Miss G was the only one in school last Friday so I’m posting her Friday lunch. She had Soy Boy ravioli at the top left. I sent vegan parmesan “cheese” not shown for her to sprinkle on her pasta. 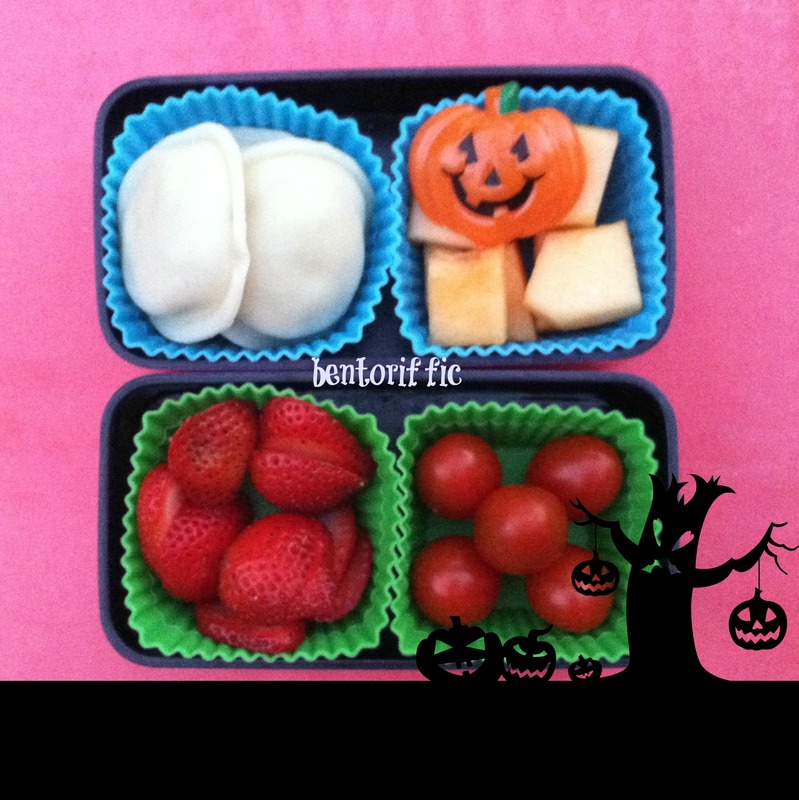 At the top right are cantaloupe pieces with a jack-o-lantern pick in them. 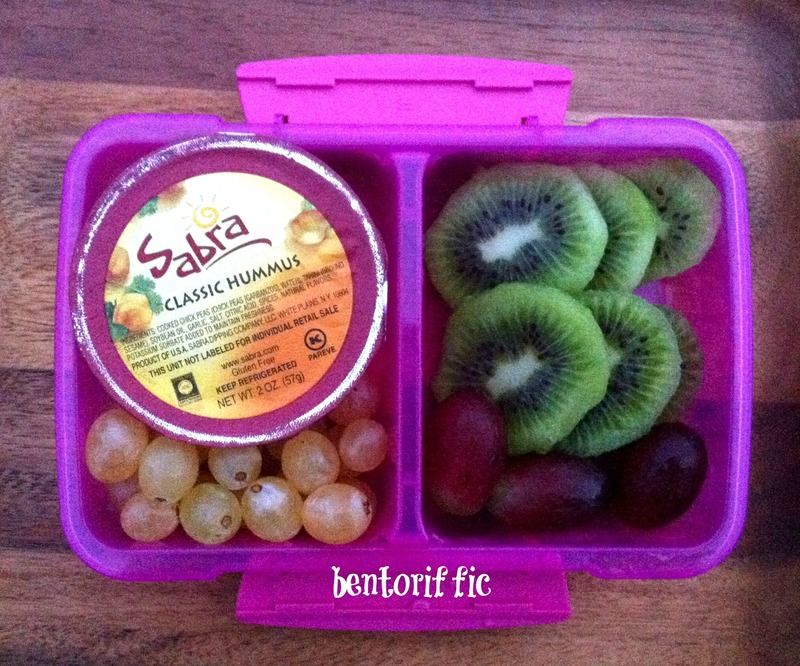 And in the bottom container are sliced strawberries and grape tomatoes. 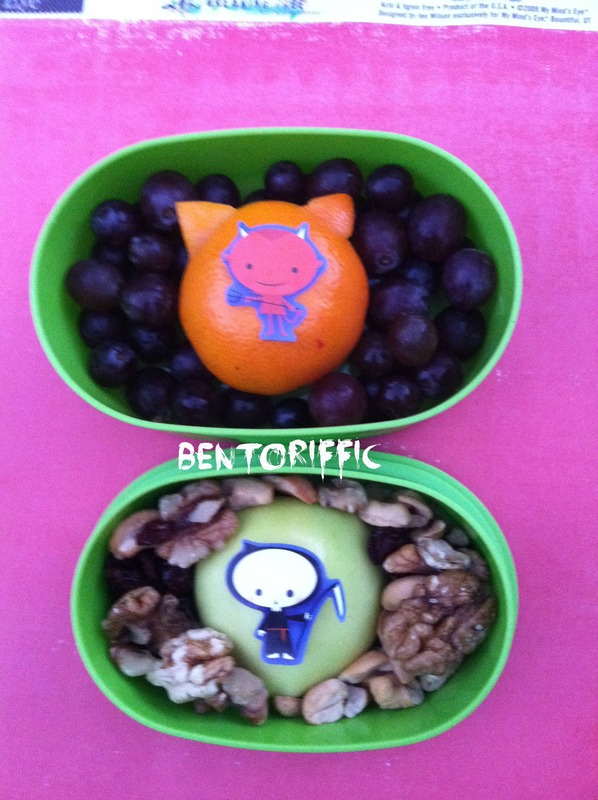 For her snacks Friday, she had black seedless grapes at the top and a develish clementine with horns. 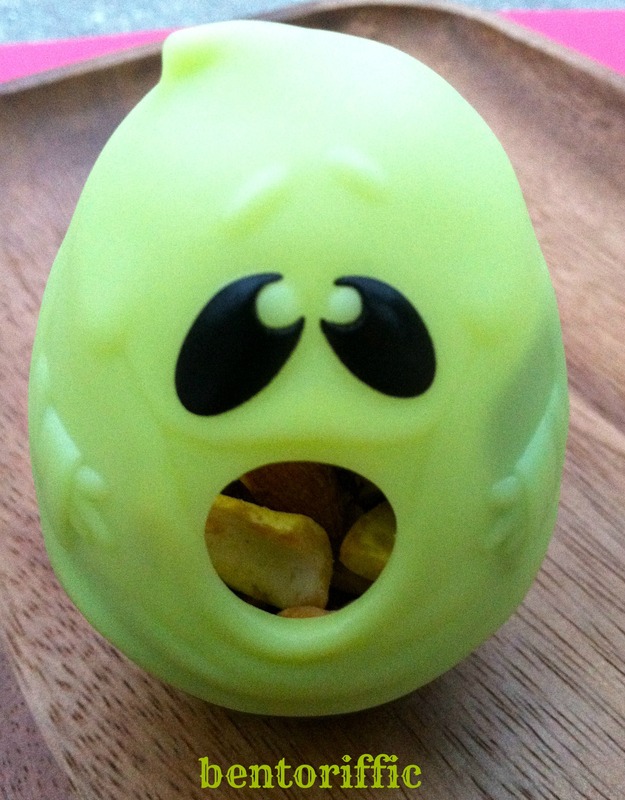 At the bottom is a half of a grim reaper green apple surrounded by cashews, walnuts and raisins. 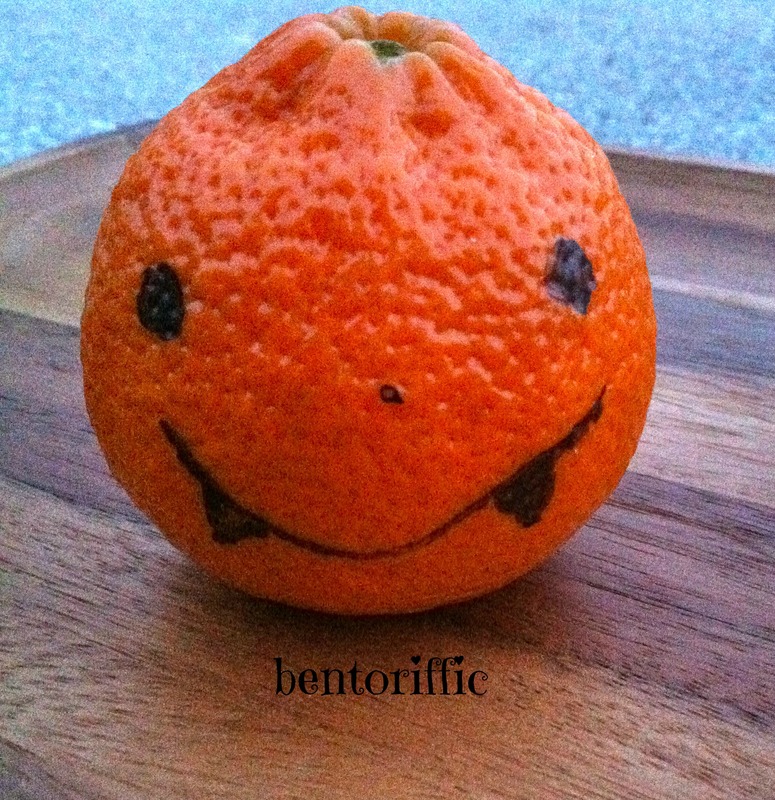 Stay tuned for a big Halloween/Fall themed blog hop on Wednesday to get some awesomely fun food ideas!